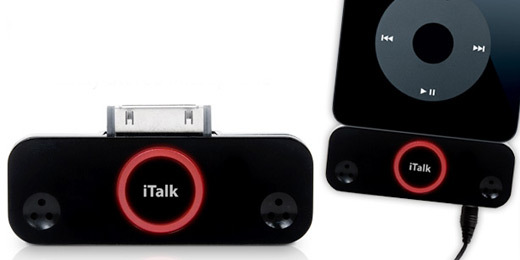 Griffin updates its iTalk stereo microphone for iPod, now releasing iTalk Pro. Just plug it in and you can get CD-quality recordings with its two microphones, plus it's got a 3.5mm jack at the bottom so you can plug in your own microphone. It's compatible only with the fifth-generation iPod video and second-generation nano, yours for $50. This might come in handy when we need to record those long-winded interviews. But too bad it's a bit inconvenient when using it with the second-gen iPod nano, requiring you to unplug iTalk from the bottom of the nano if you want to listen to your recordings, because the nano's headphone jack is in that same location. Could it have been so hard to put an audio pass-through jack on the thing?